Come in and try our new Stairway! The ultimate stair climber provides a great cardio workout that’s easy on your joints but at the same time builds pretty much every muscle in your legs and glutes due to it being a weight-bearing exercise. The repetitive step motion helps tone your lower body while working your core muscles at the same time. You can alternate the speed on the machine, you can exercise to your preference, whether that’s low intensity steady state cardio or high intensity interval training. 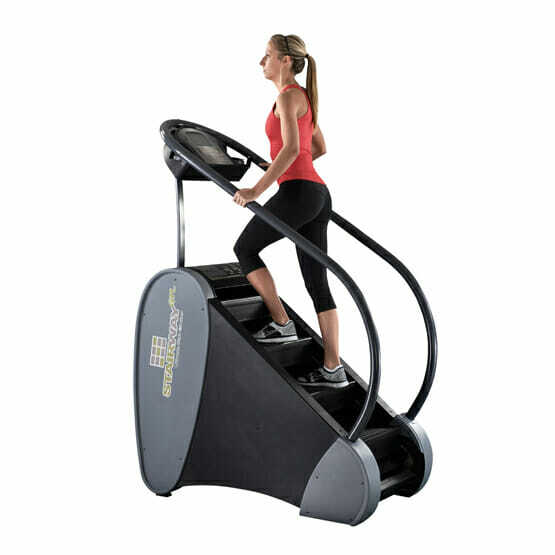 Either way, a stair climber is a machine which is suitable for all fitness abilities and levels and a great way to get your heart rate up, improve cardiovascular endurance and stamina. Can an exercise machine really “transform lives” or is that just a marketing gimmick? Jamestown Fitness has just installed a new exercise machine, called a NuStep ™ which really truly delivers on that promise. This machine is used at Newport Hospital’s Vanderbilt Rehabilitation Center and in hospitals and physical therapy centers across the nation as the top-rung in rehab for spinal injuries, hip and knee rehabilitation and post-surgical recovery. Or for anyone who wants a good workout. So how does it work? Well, it’s an inclusive recumbent cross-trainer, or a seated elliptical machine. Huh? This means simply that it can work out the arms and legs separately OR together. Because you are seated, there’s less stress on the back and the resistance can be adjusted for shoulders, knees and hips. JFC recognized early on that part of our mission is to provide exercise opportunities for seniors and those with impaired mobility. Babs Porter, age 90 and a founding member and shareholder, charged forward and donated a brand new NuStep to the Fitness Club almost before you could say rehabilitation. It arrived this week. Staff hours start at 9 AM. Before that the gym is open for members who have obtained door entry card from the front desk. The same applies to Saturday and Sunday 3:00 PM - 6:00 PM.